General Dynamics Land Systems's expeditionary fighting vehicle (EFV) personnel variant (EFVP1). The expeditionary fighting vehicle (EFV) will be the new amphibious assault vehicle for the US Marine Corps. The EFV vehicles will be launched from US Navy amphibious ships at a ship-to-shore distance of up to 46km (25nm). The EFV is being produced in EVP1 personnel (left) and EVC1 command (right) variations. The EFVP1 personnel variant can carry 17 fully equipped marines. The EFV has two waterjets, 58cm (23in) in diameter, for water propulsion, providing a water speed of 45.6km/h. The rear hatch of the EFV. The EVC1 command variant has three vehicle crew stations and seven command crew stations. 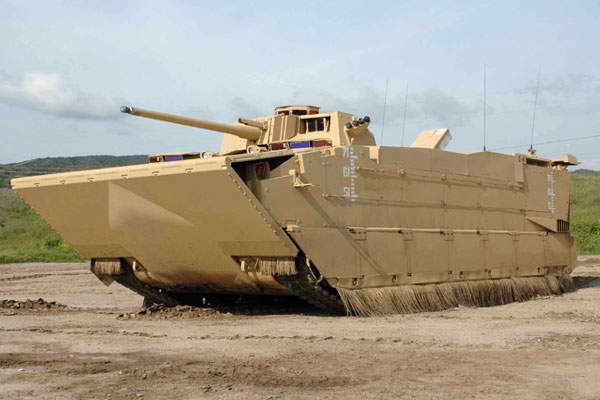 The US Marine Corps selected General Dynamics Land Systems to develop a new advanced amphibious assault vehicle (AAAV) in 1996. The name was changed from advanced amphibious assault vehicle to expeditionary fighting vehicle (EFV) in September 2003. The EFV will replace the current amphibious assault vehicle which entered service in 1972. The current requirement is for 573 vehicles comprising personnel variants (EFVP1) and command variants (EFVC1). "The expeditionary fighting vehicle provides the US Marine Corps marine rifle squad with tactical mobility in amphibious operations and in the subsequent ground combat manoeuvres." Initial operating capability was planned in 2015 and full operational capability in 2025. 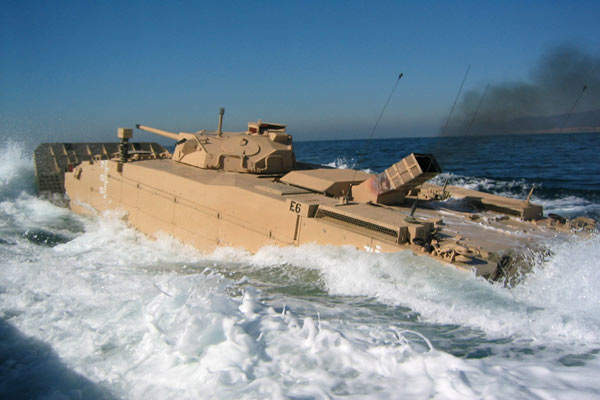 The US Marine Corps, however, announced their decision to terminate the EFV programme in 2011, saying it is not affordable. An analysis performed on this issue suggested that situations demanding power projections from the sea could be handled through a mix of current air and sea systems. The expeditionary fighting vehicle provides the US Marine Corps marine rifle squad with tactical mobility in amphibious operations and in the subsequent ground combat manoeuvres. On land the EFV will carry out manoeuvre and combat operations as part of the Marine Air-Ground Task Force. The vehicles will be launched from US Navy amphibious ships at a ship-to-shore distance of up to 25nm, i.e. beyond the visual horizon. The vehicles can transit to shore at high speed and travel inland up to 200 miles without refuelling. Once refuelled the vehicles have a range up to 340 miles. The EFV began system development and demonstration (SDD) in 2001. In March 2007, General Dynamics was awarded a continuation of the SDD phase with funding for a design for reliability (DFR) phase to September 2008. 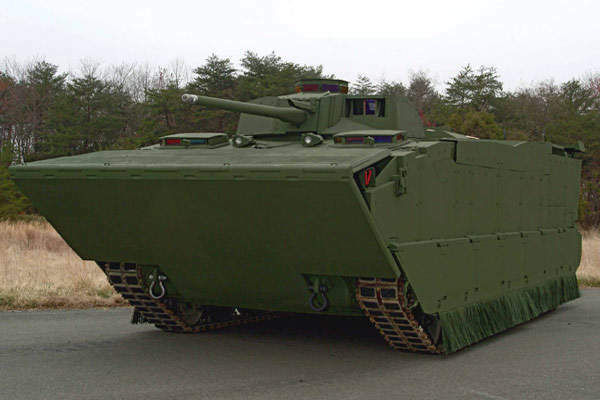 Due to reliability issues and concerns about excessive weight, the USMC negotiated with General Dynamics to repeat the SDD phase and awarded a second SDD contract for two EFV prototypes in July 2008. In June 2008, Alion Science and Technology was awarded a contract to design an alternate bow flap to increase the EFV’s reliability. In January 2009, the EFV took part in USMC trials aboard the USS Peleliu (LHA 5) amphibious ship off the coast of California. The IOC will cover systems for three platoons. One EFV platoon, for marine expeditionary unit deployment, will consist of 13 personnel vehicles and one command vehicle. One platoon will be dedicated to new equipment training and a third platoon will be in production. Both the personnel and the command variant provide voice communications and standard variable message format (VMF) and United States message text format (USMTF) digital information, including messages and overlay data. The vehicles are operated by a crew of three, including the vehicle commander, gunner and driver. The personnel variant carries 17 fully equipped marines, i.e. a rifle squad of 17 marines, each with individual combat equipment. The vehicle has internal stowage for each marine’s ammunition and march-load equipment, i.e. the load for the prosecution of combat operations for extended periods with access to daily resupply. The vehicle will also be capable of carrying other crews and equipment, and has a cargo capacity of 8,150lb in lieu of infantrymen. The command variant vehicle, EFVC1, is a command and control platform at battalion and regimental levels, carrying the three vehicle crew plus the battalion and regimental staff. The vehicle is linked to the US Marine Corp’s C2I (command, control and intelligence) and the USMC fire support. The vehicle accommodates the three vehicle crew stations and seven command crew stations. The command variant vehicle is armed with a 7.62mm general-purpose machine gun. The troop commander’s station is equipped with voice and data communications, a digital map display and a display downloaded from the vehicles’ thermal imaging systems. The EFV includes a planing hull design for high speeds across water and is constructed of 2519-T87 aluminium, a high-strength aluminium-copper alloy. Integral spall protection is installed and blast-protected seats are fitted. The hull provides protection against armour-piercing rounds and fragmentation devices. Access to the troop compartment is via a hydraulically operated rear ramp. A troop door is also fitted into the ramp and two sliding hatches are installed in the roof over the troop compartment. 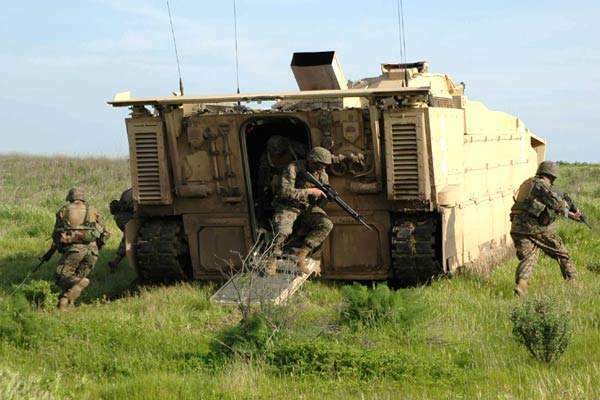 The engine compartment is located in the centre of the vehicle and the troop compartment is in the rear of the vehicle up to the sides of the engine compartment. The troop compartment is fitted with armour protected padded seats and seat belts. It is air-conditioned and fitted with an overpressure collective protection system against nuclear, chemical and biological warfare. The electronically powered two-man mk46 turret on the personnel variant accommodates the commander on the right and gunner on the left, a fire control system and the main and coaxial weapons. The mk46 turret incorporates a 30/40mm ATK mk44 Bushmaster automatic gun which has a firing rate of 200 rounds a minute and can fire all standard Nato 30/40mm ammunition. A general purpose M240 7.62mm machine gun with 600 rounds of ready-to-use ammunition is mounted coaxially with the main gun. Smoke grenade launchers are installed on the hull. The vehicle has fire-on-the-move capability and the hit probability is 90% at a range of 1,200m. The turret is equipped with a compact modular sight developed by General Dynamics which includes a thermal imaging sight, laser rangefinder and Kearfott dual-axis head assembly (DAHA). The DAHA is gyroscopically stabilised to 50mrad in azimuth and in elevation, providing a stabilised line of sight for the weapon fire control system on the vehicle. L3 Communications, Cincinnati Electronics was awarded a contract for a ‘drop-in’ replacement for the thermal sight on the EFV in September 2007. The sight is based on L3, CE’s NightConqueror thermal imager, which uses a medium-wave (3.6-5.0 micron) indium antimonide staring focal plane array. The commander’s station is equipped with five forward and one rear-facing periscope sights providing a view of 360° azimuth. The EFV is powered by a 2,700hp dual-use (for land and water) MTU MT883 Ka-523 diesel engine. The 12-cylinder diesel engine is mounted in the centre of the vehicle. On metalled roads the maximum speed is more than 45mph. 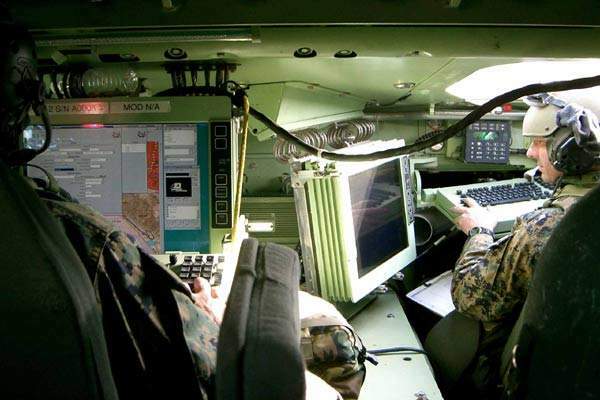 "The US Marine Corps selected General Dynamics Land Systems to develop a new AAAV. The name was changed from advanced amphibious assault vehicle to expeditionary fighting vehicle (EFV) in September 2003." The actively damped hydro-pneumatic suspension units, supplied by General Dynamics, and the vehicle’s lightweight band track reduce the noise and vibration, giving a more comfortable and fuel-efficient ride for the crew. The continuous moulded lightweight band track was developed by Goodyear and provides traction and strength comparable to the heavier, standard block-type track. The vehicle has seven pairs of road wheels and hydro-pneumatic suspension units fitted with automatic ride height control. About 80% of the amphibious vehicle’s mission is performed on land and 20% in water. 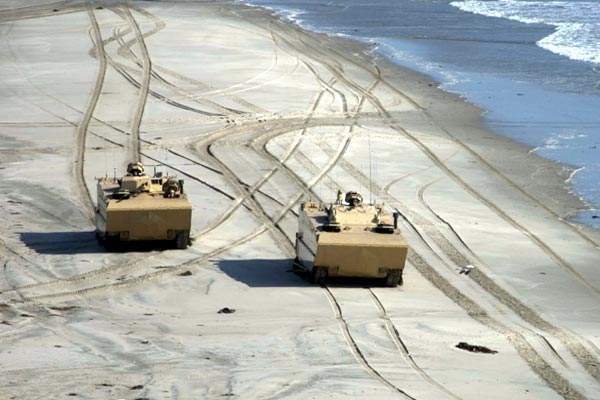 The vehicles can be deployed in high-speed amphibious landings in seas up to sea state three. 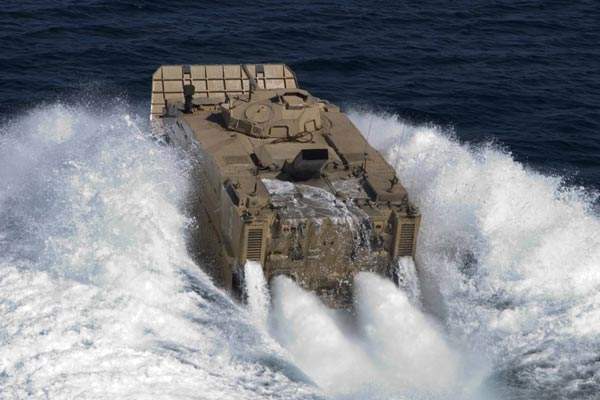 In order to sustain movement in the transition between water and land drive, for example in movement in water over high corals reefs which would otherwise cause dangerous hang-ups for amphibious assault vehicles, the vehicle is equipped with a power transfer module supplied by Allison Transmission Division. The power transfer module automatically shares engine power between waterjets and the vehicle tracks according to how it senses the need. The powertrain and the driveline absorb the transition shock as the vehicle rapidly shifts from one operating mode to another while the vehicle traverses obstacles such as coral mounds in the water. When the vehicle is afloat, the engine couples via the power transfer module to Honeywell counter-rotating 23in waterjets mounted on both sides of the vehicle. In endurance tests and in high water speed tests the vehicles have regularly demonstrated high water speeds of more than 25kt in significant wave heights (SWH) of more than 2ft. In the water, the prow plate opens forwards, the flaps over the water jets open and the hydropneumatic suspension retracts. Five bilge pumps, two electric and three hydraulically driven, are installed to maintain buoyancy.